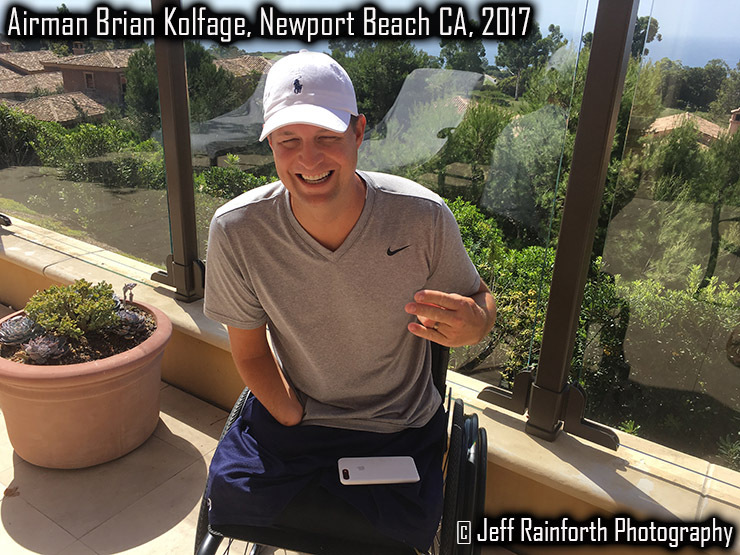 I was in touch with my friend, triple-amputee vet Airman Brian Kolfage, last night & today. The campaign to raise funds for the border wall that he started has grown far larger & far faster than he ever expected. In just 5 days, Airman Kolfage has raised over $15 million to keep Americans safe from terrorists, criminals, & drug dealing cartels. Kolfage, an Air Force veteran who signed up to defend America after the 9/11 terror attacks, has been bombarded with interview requests from media and he frequently travels to news stations on his own to do them. On top of that, managing logistics for the massive wall operation has turned out to be extremely taxing. Management of the wall project includes: Continuous communications with the Trump administration & various members of Congress and legal experts, creating & maintaining a new website, data analysis, maintaining an engaging presence on several social media platforms, and responding to as many people as he can who have questions (thousands), among other things. 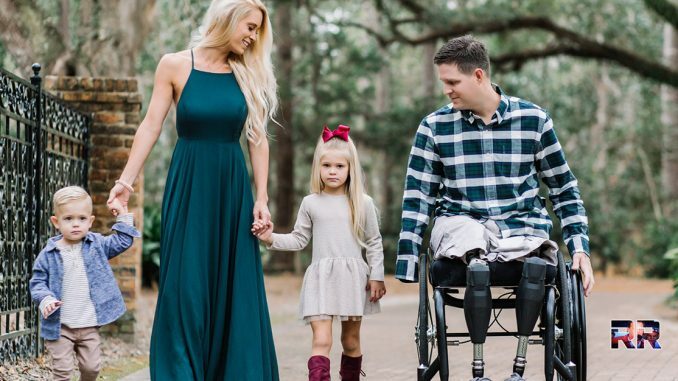 You have to remember, Airman Kolfage has to get around in a wheelchair as he lost both of his legs at the hips, and he only has one hand to type & use his phone with (along with everything else). Currently, Airman Kolfage is working about 20 hours a day on the wall campaign. If he forgets something when he gets tired & goes to bed, it’s a major chore just to climb to the floor, then to his wheelchair, then back into bed when he’s done. He can’t just get up & walk where he’s going like most of us can. 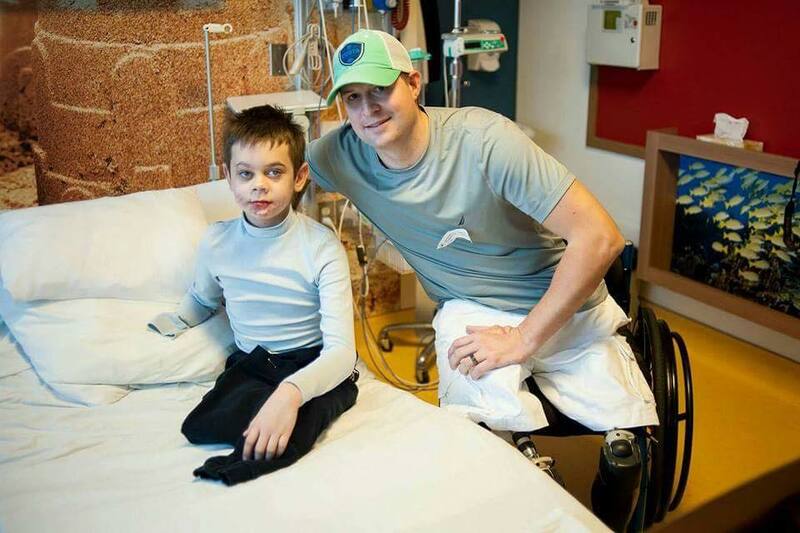 Here’s a video clip from the Gary Sinise Foundation. Brian was interviewed by Sinise in 2016. In the video, Brian explains that it takes a “ton of work” just to walk. He goes on to tell of when he & his wife Ashley had their first child, and how he felt his body wearing down because of the energy it took to take care of his new family. Brian had turned down an offer from the actor for his foundation to build him a home because he thought there were other wounded veterans who needed it more. Watch. If Brian felt that then, you can only imagine what he’s feeling now with the rigors of the new campaign to fund the wall, and also taking care of his family. 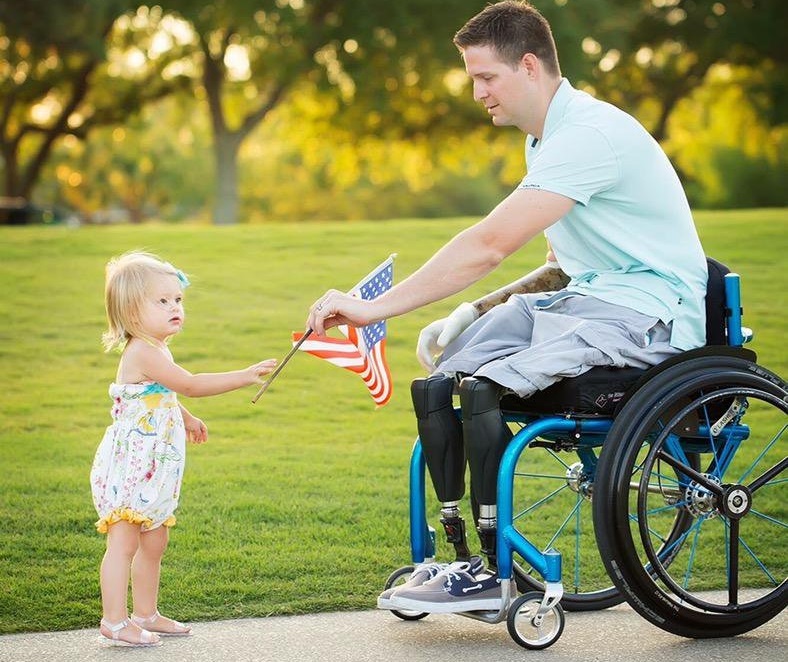 Amputee veterans have many more hurdles to jump in life than we do. We think of them as larger-than-life heroes, which they are, yet, they get tired too, and most of us will never experience what they have to overcome every minute of every day. 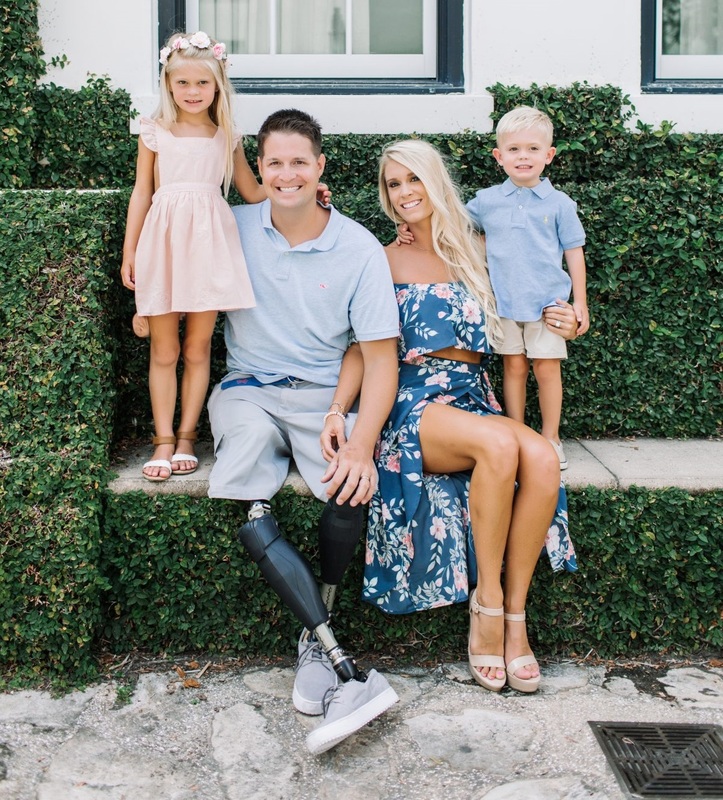 On top of taking care of his family, a beautiful wife and two amazing kids, Airman Kolfage is also managing his coffee company, Military Grade Coffee, through which he donates 10% of proceeds to veterans charities. The company is also how he provides for his family. Airman Kolfage is a highly motivated and energetic person. He’s determined to see the funding for the wall go through to keep Americans safe and he’s not taking a dime for it. His current hectic schedule is turning out to be exhausting, though. I communicated with Brian earlier & he mentioned again that he is getting very little sleep trying to keep up with everything. I’ve known Airman Kolfage for about 8 years and we’re good friends. We’ve also worked together on several projects. We’re in constant contact via text or by phone & he normally laughs at jokes I crack & makes them himself, but not so much since the wall project started, and last night he laughed at nothing & abruptly said he’s going to bed early because he only slept 4 hours. I can tell he is feeling the effects of the campaign. Kolfage didn’t ask me to post this, and he wouldn’t ask for help for something like this, but I’m asking that you keep him in your prayers. For strength, stamina, a stress-free environment, and for peace of mind. He has incredible willpower, but he’s not indefatigable (He’s close to it, but we all have our limits, even the best of us). Many on the left want to see Kolfage fail, and they are attacking him relentlessly. I’ve seen many of the messages sent to him, and those posted online & in articles. He has absolute pure hate coming his way 24/7, with many telling him to “kill himself,” yet he doesn’t let it get to him. Thanks for considering keeping him in your thoughts & prayers. He’s a good friend & I’d like to see him around for a long time as I’m sure we all would. With that said, I’ll leave some information on how you can help Kolfage with the wall project and other things. liberals say I'm a fraud who will steal the money. Here's the truth, I own a successful business called Military Grade Coffee @MilGradeCoffee We give 10% back to veteran charities! I don't need the money like these basement dwelling socialist do. I WORK so you don't have to. 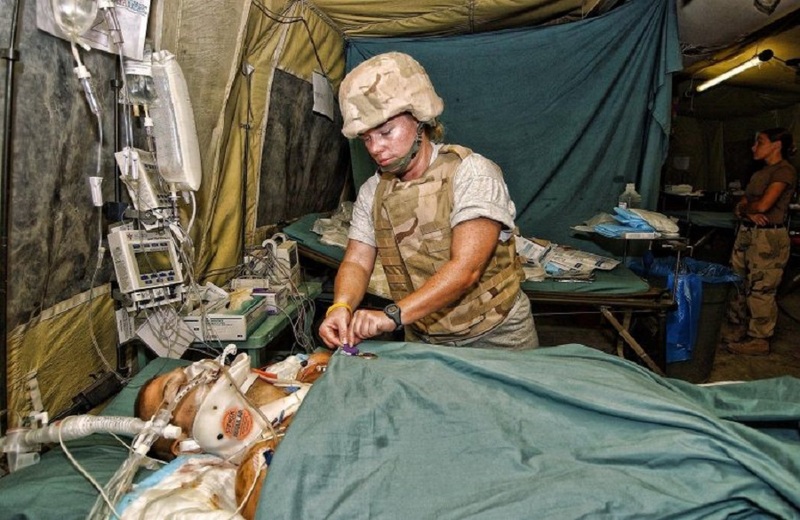 And finally, take a minute to watch Kolfage’s amazing “Alive Day” video & see what he experienced after being wounded. IF YOU DO NOTHING ELSE IN THIS WORLD, WATCH THIS VIDEO. If you don’t shed a tear, I question your humanity. Brian Kolfage alive day from Brian on Vimeo. Thanks, everyone, for helping Brian out. He’s given so much for all of us, I think it’s important we support him in return. Jeff your a wonderful friend God Bless you. Thank you, Rachel! And thank you for supporting Brian! Have a Merry Christmas & God bless you also! Brian and Jeff thank you, thank you for all you are doing. Truly true hero’s. You are in my prayers. I just got my check from work so will be putting a check in the mail to fund the wall. I’m 73 and just got laid off from my job so need to find another and when I do I will send more. In the mean time I will be praying. Jeff please watch over your friend Brian and family we need him. Thank you both for your service. Merry Christmas and a better 2019. Thank you, Ruth! And thank you for supporting Airman Kolfage! Merry Christmas to you, also! I hope your job search goes well! God bless! “Rohach” spirit that god put inside of you! Jeff you are a good friend, will pray for you !